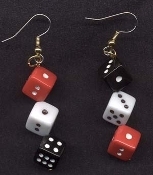 Big Funky Mini DICE EARRINGS - Realistic Miniature Lucky Pair Casino Craps Game Las Vegas Gambling Lucky Charm Novelty Costume Jewelry - Large (smaller than life size) RED BLACK and WHITE Acrylic Solid Plastic Mismatched (Opposite) Charm Beads approx. 1.75-inch (4.38cm) total length without earwire. Each dice bead is approx. 3/8-inch (0.94cm) diameter. Great for your favorite player. Mama, Daddy, Baby needs a new pair of shoes!